What do you know about your native language? To answer that question, many people would start trying to recall what they learned in school about the standard ways of speaking and writing (You’re not supposed to end sentences with a preposition. ), or in history class, about where their language came from (Something about the Norman invasion. 1066?). But what makes someone a fluent native speaker isn’t that sort of book-learning, it’s the vast implicit knowledge they acquired as a child. The implicit knowledge that tells them what order to put words in, or what sentences sound natural. How do children acquire this huge store of implicit knowledge about how their native language works? How do they master such a complex, highly-structured system in just a few years? My dissertation research addressed children’s learning of morphosyntactic dependencies, and my current research expands that work to address the effects of linguistic variation: How does learning subject-verb agreement change when you’re hearing two different dialects, or when agreement only applies in certain contexts in the dialect you’re learning? I summarize some of my previous work and current directions below. Conscious effort toward speaking and listening tends to go toward the message being conveyed. But even without paying explicit attention to linguistic structure, speakers form acceptable sentences and listeners use structure to guide their interpretations and expectations. Languages indicate the relationships among words in a sentence in two primary ways: word order and morphology. In English, we mostly rely on the order of words to tell us how the sentence works: The cat chases the dogs describes a very different scene than The dogs chase the cat. But order isn’t the only difference between these sentences. As in many languages, in English the form of the verb depends on properties of its subject: chase when the subject is plural, and chases when it’s singular. My research on 2- and 3-year-olds’ use of English subject-verb agreement in production and comprehension shows that even very young children use agreement as a clue about what might be coming up when they are listening to sentences. When children hear Where are the good cookies?, they are quicker to look to the target picture, than when they hear a sentence that doesn’t include is or are as a clue to how many things are being discussed (like Can you find the good cookies?). Furthermore, 3-year-olds treat agreement as an abstract, syntactic relationship, not as though it were only based on meaning. In comprehension tasks children still use a helpful verb as a clue, even when the two pictures show the same number of objects. 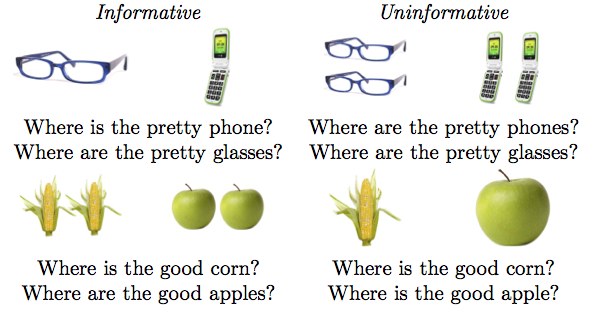 For instance, if the two pictured objects are a phone and a pair of glasses, a speaker would ask where the glasses are, but where the phone is, even though they are talking about the a single object in each case. In this sort of situation, children are faster to look to the target picture, just like they were with the apples and cookies. Similarly, when 3-year-olds are asked to use sentences to describe the location of an object in a simple display, their choice of verb agreement depends primarily on the grammatical number of the noun, not on the number of objects shown. That is, they tend to say the glasses are on the square even when they are looking at a single pair of glasses, and the corn is on the circle even when they are looking at two ears of corn. My dissertation research, much of it summarized above, suggests that even very young English-learners already treat agreement as an abstract, syntactic dependency. How did they learn this? In order to acquire a morphosyntactic paradigm like subject-verb agreement, children need to weave together information about the forms regular and irregular verbs take, what subject properties predict which verb forms, and how sentence position and sentence structure change the relationship among the constituents (or not). In my current position at Penn State, I am excited to be expanding my research to look at how variation in the linguistic input affects the acquisition of morphosyntactic dependencies. Variation in a child’s linguistic environment can come from a variety of sources: There might be people who speak different dialects (one parent from the South and one from the Midwest, for instance), there might be particular people who speak two different ways depending on context (one way for casual household things and a more “proper” way for schoolwork, for example). Within a single dialect there might also be variation in how grammatical dependencies surface in different structures, or in different social or communicative contexts. All of these sources of variation have the potential to complicate the acquisition process, yet the effects of variation on acquisition are relatively understudied. I am in the process of beginning several studies on the neutralization of agreement (as in there’s more cookies in the kitchen) in casual speech: how and where it happens, and how it affects children’s and adults’ use of agreement in processing. A better understanding of the relationship between language variation and language learning has the potential to inform both theories of language learning, and public discourse. Though it can be extremely informative to study language acquisition in relatively invariant environments, most language acquisition occurs in the midst of variation, and we need to understand how our theories apply to these more complex environments. Language variation is also at the heart of a number of social and educational justice issues in modern society: Children who grow up speaking a non-standard dialect are at risk for misdiagnosis of language delay, and face added difficulty when they begin school, since they must learn a new dialect in addition to learning the new tasks and behaviors expected of them. The better we understand how children learn to navigate linguistic variation the better we can understand and address such disparities.